Rockabilly is the dance style for anybody who wants to dance FAST! Rockabilly is distinguished by its strong anti-clockwise circular motion and momentum, which is facilitated by absence of the back-step (rock-step) common to the swing based dances. Rockabilly is also the rebels dance - it does not conform to many of the basic movements, structure, and presentation of other styles. It has a unique rhythm, motion, and emphasis - a 'feel' - that is not captured by any other dance style. Consequently, many dancers who fall in love with Rockabilly are devoted to the style and rarely desire to dance anything else. Rockabilly may be danced in several different forms, which may be loosely defined by the lead's body position: Cult (Forward), Straight-Up (Centre), and Lay-Back (Away). In practice different Rockabilly figures will utilise and/or emphasise all of these positions. Cool Cats therefore teaches from centre position, while examining the actions and body movements that create presentation Forward/Away from partner. This allows each dancer/couple to establish their own Rockabilly 'style' according to personal preferences of look and feel. Rockabilly - Oz Style. Perth dancers at the Melbourne Rockabilly Meltdown. All the dancers in this clip have been taught by Cool Cats at some point, particularly through to advanced content. Rockabilly Jive. If you searching for Rockabilly on the internet and your most likely to find this sort of Rockabilly dancing, which can be seen here to include the occasional back-step, kick/flick, and swing move. However, the overall styling and action remains distinctive. Rockabilly??? With the movement of Rockabilly dance and styles with US culture following WW2 the interpretation of 'what is Rockabilly' can be quite different. These are the (almost notorious) Rockabilly dancers of Yoyogi Park, Japan. What is Rockabilly? How is it different to Rock 'n' Roll or Swing? Rockabilly, as a dance style, means something quite different depending upon where you come from - even though the music is the same. A quick look on You Tube will show you some very different Rockabilly dancing in Japan, to the UK, to Australia. Even within Australia there are slight differences in interpretation between the East and West coast. 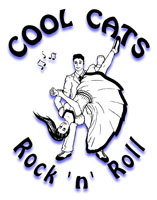 At Cool Cats, we recognise Rockabilly as a 4beat dance style where the man moves anti-clockwise around the woman - and there is no back-step! This marks Rockabilly as distinctly different from the other dance styles, which move clockwise and use a back-step as preparation for dance figures. Rockabilly is a rebel and it just keeps on moving when the other dances stop! Why would I prefer Rockabilly to other dance styles? With a good Lead, most Follows are able to quickly acquire the basic action and dance at speed. Check out this video - Imogen moving at pace (Johnny Cash - Big River!) with less than 10 weeks dancing in the style. can keep going faster. Of course, in class you need time to learn how to make that happen so the pace is modest. However, we will keep encouraging you to try the faster music, because that is when this dance style really shines!